Class A divisions are considered amateur divisions while Class AA are professional. Competitors who compete in Class AA are eligible to compete in the overall grand championships for money prizes, can get ratings points (ISKA, NASKA or other participating organizations) for their performances and also may be considered as a performer in the ISKA Night of Champions. 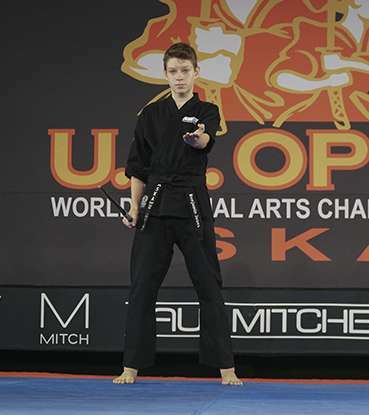 Class A competitors are not eligible for money prizes, to participate in the Class AA grand championships or to appear in the ISKA Night of Champions. Can I compete in both Class AA and Class A divisions? Yes but not in the same discipline. If you are ready to compete in Class AA sparring but want to compete in Class A forms or weapons, this is allowed because sparring, forms and weapons are not the same discipline. You would not be allowed to compete in sparring in both Class A and Class AA divisions. The only exceptions are in continuous sparring, Sport MMA and all team sparring besides 3-Man team. There are no Class AA level continuous or Sport MMA sparring divisions so competitors of all levels may participate in the Class A continuous divisions and Sport MMA divisions even if competing in a Class AA point or CLASH sparring division. Can I compete in multiple age or weight divisions? No. You must determine your age and weight category and compete consistently at the event in the category you choose. For instance, if you are 34 years old, you may not compete in both 18 & over forms, weapons or sparring and 30 & over forms, weapons or sparring. You must choose to compete in one age category only. Do I need to buy a spectator ticket if I am a competitor, under age 5, etc.? If you are a competitor, you do not need to purchase a general admission spectator ticket because your competition fee includes a 2-day general admission ticket. Competitors may attend the Friday and Saturday eliminations as part of the competition fees. Children 5 and under may spectate at the Friday and Saturday eliminations at no charge. EVERYONE needs to purchase a reserved seat if they want to attend the Night of Champions. How do Night of Champions spectator tickets work? If you are a competitor, you will receive a discount on Night of Champions Reserved seating. You can also upgrade to better seating at a discounted rates if you are a competitor, or you purchased a spectator pass for the eliminations. For non-competitors who are just looking to attend the spectacular Night of Champions, tickets for reserved seating may be purchased online. How do I exchange purchased divisions? If you have participated at a karate tournament before, chances are you have experienced that you registered the wrong division, or simply you changed your mind about a division and want to exchange it. This is a common issue at tournaments and one of the causes for long lines at registration tables. Where to find my purchased orders? How to edit competitor info? Go to the Refund Policy page to learn more.